Wind Rose is representation of data in such a way that it helps us to understand wind direction, speed and frequency in circular format. Wind energy is considered as a renewable source of energy which can be used to operate windmills and wind turbines at locations where the intensity and speed of wind energy is strong enough for them to function properly. Windmills are used at industry and household level to conserve power, whereas wind turbines are used in wind farms and wind energy industries. The Danish wind industry association mentioned that determining wind direction helps in setting up wind turbines and windmills in the direction of the wind and to a suited elevation. The average of annual measurements is taken for placing in the locations where maximum wind speed can be received. Thus, it is important to determine the necessary wind data of a target area to estimate a suitable location for installing windmills and wind turbines. This can be achieved by drawing or constructing a wind rose diagram. In 2010, Fondriest staff defined wind speed as the speed of air blowing over a particular location in a specified time, and wind direction as an indicator of the direction from where wind begins to generate. How to read Wind Rose Diagram? Wind speed and direction are both important for evaluating weather conditions and climate and predicting them. Moreover, these parameters influence processes such as evaporation rates, surface water mixing; which further affect the water quality and the water level. National water and climate centre (NCRS), USA explained that a wind rose enables the understanding of the direction and distribution of wind speed at a specific location. A wind rose is represented as a series of concentric circles with spokes where the length of each spoke is linked with the frequency of wind blowing from a certain direction indicated by that particular spoke. speed. For example, the Danish wind industry association agreed that wind rose is considered to provide relative distribution of wind direction. Munn (1969) declared that wind direction determines the quality of air and pollution, and wind roses are helpful for detecting the pollution in air, and also explained that winds are lighter during the night than during the day and in summer as compared to winter. These points must be kept in mind while assessing air pollution using wind roses. How to make Wind Rose diagram? Some websites such as the state climate office of North Carolina, allow creation of wind roses on their websites by entering wind data of the target location. 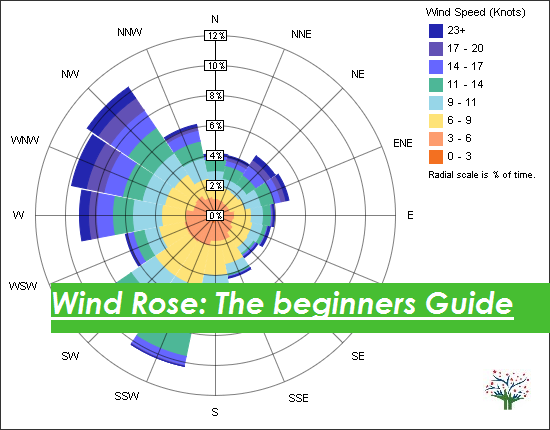 Alternatively, wind rose diagrams can be created manually or by using Microsoft Excel or by downloading a suitable software designed to generate a wind rose diagram. Australian Bureau of Meteorology reported that wind roses provide information on the occurrence of winds at a location, explaining their strength, direction and frequency. Danish wind industry association declared that wind roses vary with location, however they may show similar readings within a locality; therefore average values are taken. Are there any drawbacks of a wind rose? nction of wind direction. Wind data can be represented statistically as boxplots. Graedel (1976) declared that wind rose diagrams may be difficult or complex to construct and some may prefer wind boxplots instead. A wind boxplot illustrates wind direction and speed in a better way than wind rose and it can work in association with computer graphics and statistical tools. Despite the drawback mentioned above, wind roses are widely used in industries for environmental monitoring and for keeping an eye on the air pollution levels. With the different web applications for drawing wind rose diagrams, some may not find it complex to use and construct. Munn (1969) explained that one of the main uses of wind rose diagrams is to interpret the air quality associated with each wind direction drawn. Wind roses also find their use in environmental monitoring industries where they can be used to monitor the wind patterns and predict harsh climatic conditions such as tornadoes or hurricanes, as well as to monitor the air quality and water levels. Similarly, wind roses are used by meteorology department to monitor the climate and may be used in airports for guiding flights to take off in the right direction where there will be minimum interference by wind. Was Delhi odd-even rule successful?